The popularity of basketball shorts as casual wear for youths and adults alike makes it easy to forget the importance of having the right shorts to create unity and comfort in a variety of sports teams during play. When basketball shorts are part of a sport’s team’s uniforms or they are used for every member of a school or other facility, consistency in materials, color and design are all important factors. Ordering wholesale basketball shorts from a reputable manufacture can ensure you have the consistency you need and the quality products you demand without the high price tag on many of the brand names today. Many organizations believe that ordering wholesale apparel will mean getting fewer options for customization and settling for a lower quality product. The In-Stock Program at Dodger’s Industries includes superior quality athletic apparel that is ready to ship out for fast delivery. There is also a variety of apparel to choose from to accommodate a full scale of needs without compromising quality. People of all ages and at all levels of athletic ability love to wear basketball shorts. While one reason for this is the comfortable style and easy fit, today’s technology extends to the development of fabrics that do not hold in moisture. In the past, cotton was often the fabric of choice for athletic apparel because it was natural and allowed air to pass through. Today, we know that cotton absorbs moisture and holds it against the body. Modern technology has advanced to create fabrics that wick moisture away from the body so that athletes are cooler, more comfortable and less likely to become irritated. Fabrics that wick moisture away from the body are made from polyester blends and many are made in a lightweight mesh fabric that is even cooler. When purchasing wholesale basketball shorts, you are likely to have a number of styles to choose from in addition to your choice in lengths. Make sure you choose the ones that will provide the greatest cooling benefits regardless of who will wear them and where. The big benefit of purchasing them wholesale is that you will pay a lot less than purchasing similar brand name garments made from the same types of fabrics. Having a wide variety of colors to choose from is just one of the ways that you can customize your basketball shorts for your team or school. 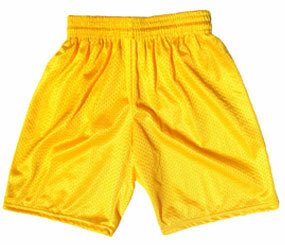 You can also purchase wholesale basketball shorts with or without pockets, cut, length and with or without a lining. While they may not be available as a per piece purchase, they are available with small minimum purchase requirements that make them a good option for all types of teams and organizations. When purchasing wholesale basketball shorts from a manufacturer, reputation and experience are even more important than when purchasing brand names out of a retail store. The manufacturer does make a difference and a long list of satisfied customers is evidence that you can expect a quality product and excellent service.